With Navarathri coming to an end, its time to clear our refrigerator with some items which are not got regularly. One such item is beetal leaves. I have a huge bunch and I really don’t know what I should do. Similarly I purchased tulsi (Holy basil) for preparing the tulsi and cardamom water and I am left with a huge bunch in that also. Today’s post is about Tulsi & Beetal Leaves rasam which is a mix of tulsi,beetal leaves, pepper, carom seeds & Jeera seeds. Beetal leaves have innumerous health benefits which includes control of diabetes, weight loss, indigestion to name a few. I remember in childhood we were not allowed to eat beetal leaves and there were lots of grandma stories built around it like a cow would come and hit you if you eat J etc. Though scientifically, I could not find any reason from any of the sources. It is however very good for pregnant women. Holy basil plant on the other hand is available in many houses in India as it is considered as a sacred plant. It is been used in auyurvedic medicines. I use them to make kashayam , tulsi cardamom water etc. Though I couldn’t have one plant in my home in Singapore due to lack of sunlight in my balcony, I can very well purchase the leaves from Little India whenever I needed. Hence whenever I visit Little India I purchase them in bulk and wrap them in a newspaper and store them in the fridge. Only for basil I don’t remove the stem as it stays fresh for longer time with the stem. 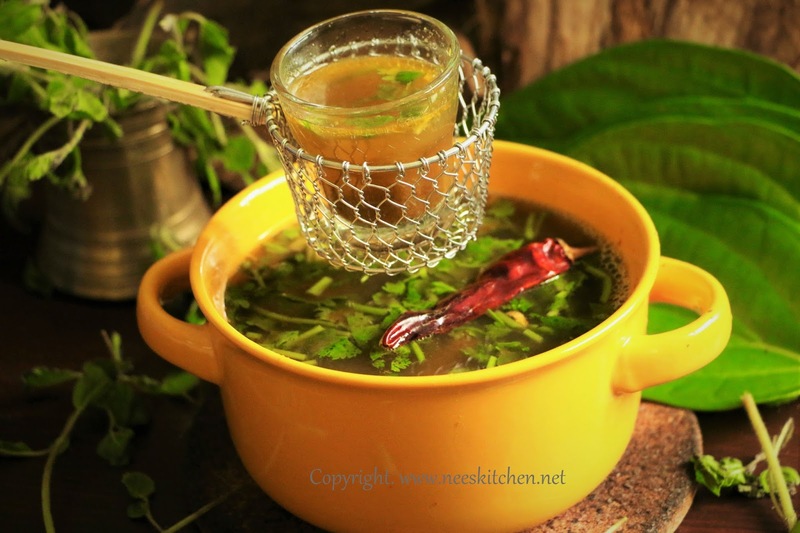 The rasam is good for cold and cough and can be consumed as a soup also. I have not blended the ginger with the rasam as we like the crunchy ginger in our rasam. However the ginger can be blended along with other ingredients. Garlic is completely optional and can be omitted if you don’t need to. 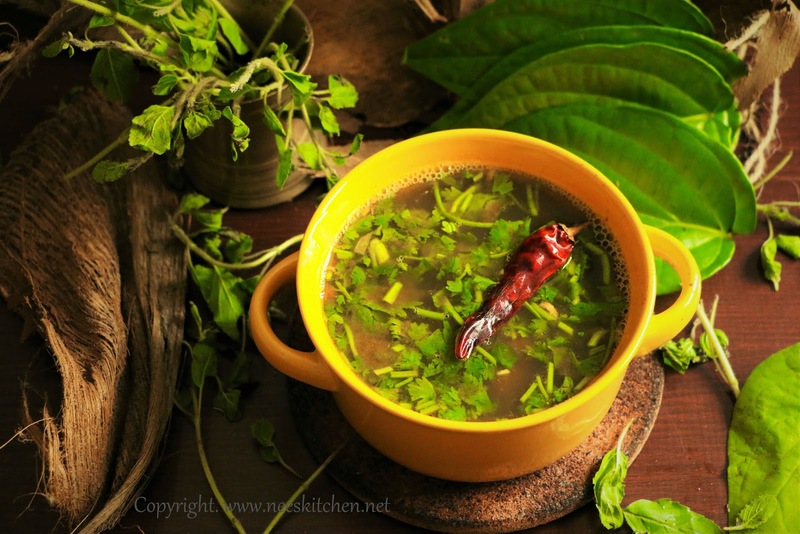 The rasam generates body heat hence it must be consumed only during cold/rainy or winter time. 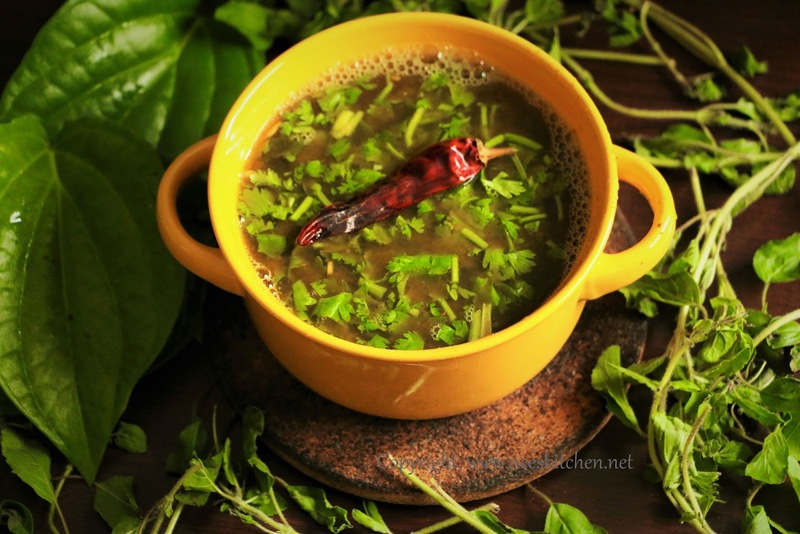 The rasam is also spicy as the taste of beetal leaves, tulsi, carom seeds & pepper are naturally spicy. I am not sure if this can be consumed as a pre-natal diet due to this heaty nature. However this is very good for postnatal diet. I have used Himalayan pink rock salt as they are good in balancing your PH Levels (Alkaline) and increases the hydration to name a few. You may replace with your regular salt if you don’t have one. 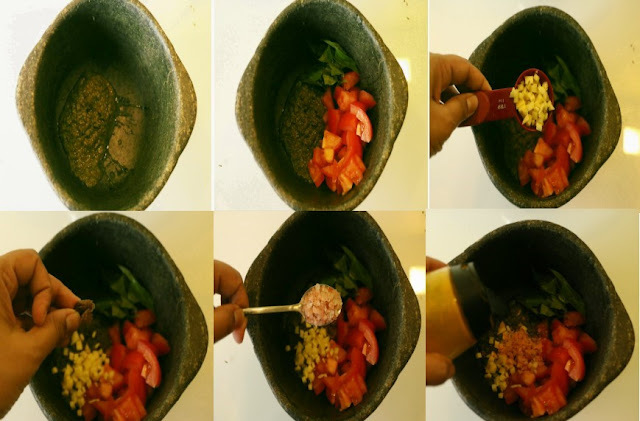 For a better taste you may use a soapstone vessal or claypot vessal as they would be tastier and helps to retain the minerals from the ingredients. 1. 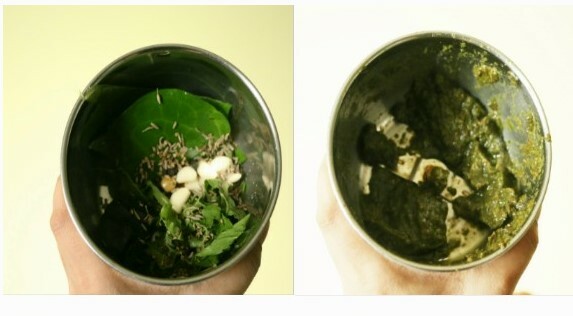 Clean the beetal leaves and tear it into 2 parts discarding the thick stem in between the leaves. 2. Take out the leaves from the tulsi and discard the stem. Wash the leaves thoroughly. 3. Blend beetal leaves, tulsi, garlic, pepper, cumin seeds, tamarind, omam (carom seeds) into a fine paste adding little water. 4. Take a rasam cooking pot, add the ground beetal leaves & tulsi paste, ginger , chopped tomato, curry leaves, salt, turmeric & hing. 6. Let it boil well for 15 minutes in low flame. 7. After boiling add rasam powder and cook until frothy. 8. Temper with ghee, mustard and red chili. 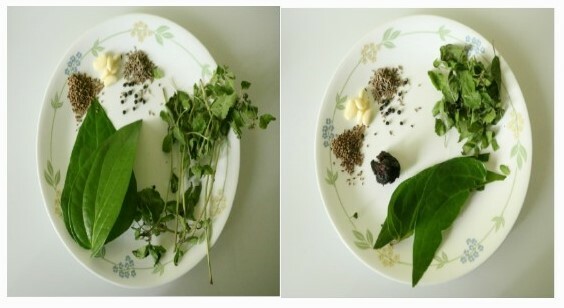 è Ginger can be ground along with the beetal leaves & tulsi mix.